The last week of 2011 saw a massive jump in apps downloaded and devices activated as those receiving gifts jumped right in and started using them, downloading a combined 1.2 billion href=”http://www.apple.com/ios” rel=”homepage” target=”_blank” title=”IOS (Apple)”>iOS and href=”http://code.google.com/android/” rel=”homepage” target=”_blank” title=”Android”>Android apps, reports Flurry. The bump was significant, as the previous weekly high was 857M downloads. 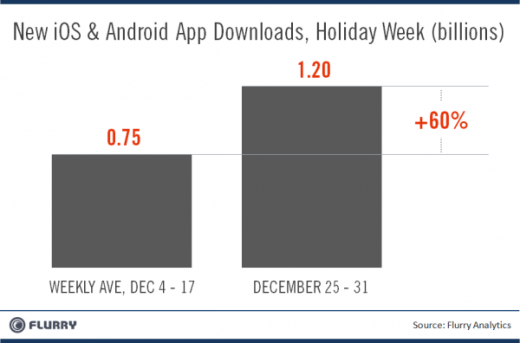 That marked a 60% increase in apps downloaded from earlier in December, blowing right through the billion-app barrier. The US led the pack, with 509M downloads. This follows up Google announcing 3.7M Android activations over the Christmas weekend. Flurry says that the Christmas season may have not have had as much to do with the record numbers in the world outside of the U.S.. China, it points out, a country with some 60% of the population not identifying with a religion, came in as the second highest region with 99M downloads. This doesn’t take into account the fact that many Chinese to celebrate Christmas as a secular holiday, often in conjunction with Chinese New Year. Both of these events are treated as an opportunity to give and receive gifts. It’s therefore likely that the season did indeed contribute to the record numbers in China. Canadians showed the biggest over-indexing of app downloads to devices as they came in 4th on the list with 41M downloads, but stand 8th on the list in number of devices activated. With a large portion of the world’s population still not in the smartphone market, it stands to reason that we should see the billion-download mark get hit on even non-holiday weeks in 2012.